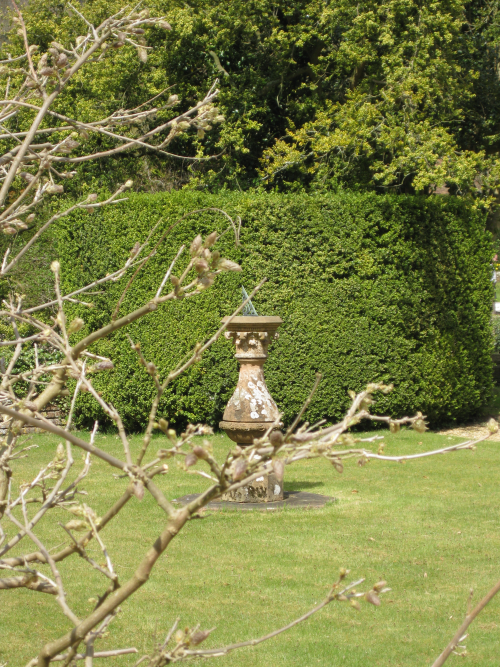 This week’s Gardeners’ Question Time on BBC Radio 4 includes a six-minute feature on Sayes Court Garden. In it I speak to Matthew Wilson, in the rather cold and bleak setting of Sayes Court Park, about what the garden looked like in its seventeenth century heyday, and what might happen there in the future. If you miss the programme tomorrow, it will be repeated at 14.00 on Sunday, and will be available to listen to on BBC iPlayer as well. The feature starts at 29.29 mins. into the programme. An alarming welcome to a garden, you might think! But so translates the Latin quotation that heads John Evelyn’s handwritten list of classical mottoes displayed around Sayes Court Garden: “O pueri fugite hinc, latet anguis in herba.” I can only speculate why he chose to use this particular line. Was it a serious warning about the darker side of nature? 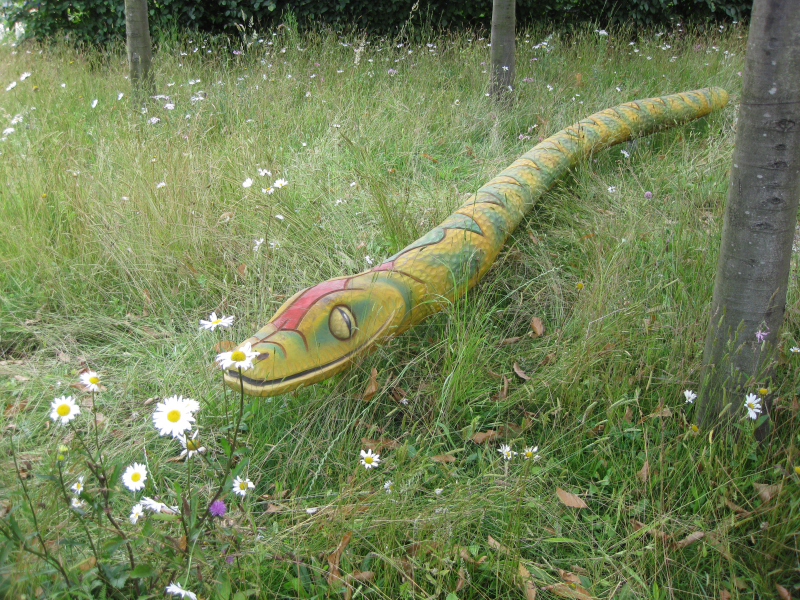 Or was it perhaps meant as a joke, and the snake a harmless painted or sculpted one, a bit like this lovely one I spotted recently at Hampton Court Palace Flower show? The quote is a line from Virgil’s Eclogues (3.93), uttered in an enigmatic singing match between two shepherds. In the seventeenth century, anyone with a good education would have known where most of Evelyn’s quotations came from, and been able to appreciate their aptness for the situation in which he had placed them. 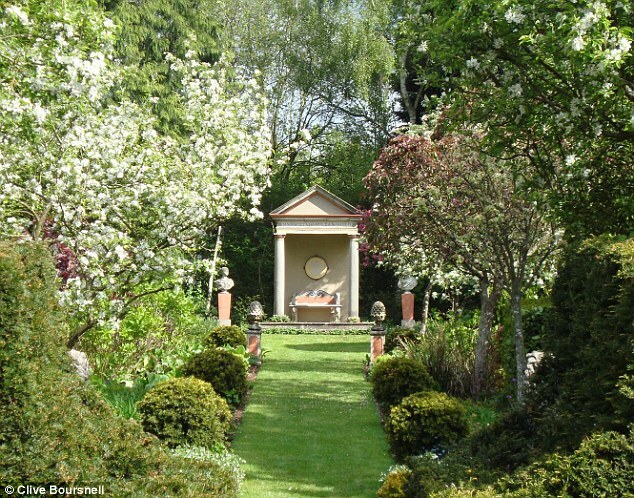 A walk around Sayes Court garden would therefore have been not just a horticultural experience but also a carefully thought-through literary, philosophical, and even spiritual one. Alas! 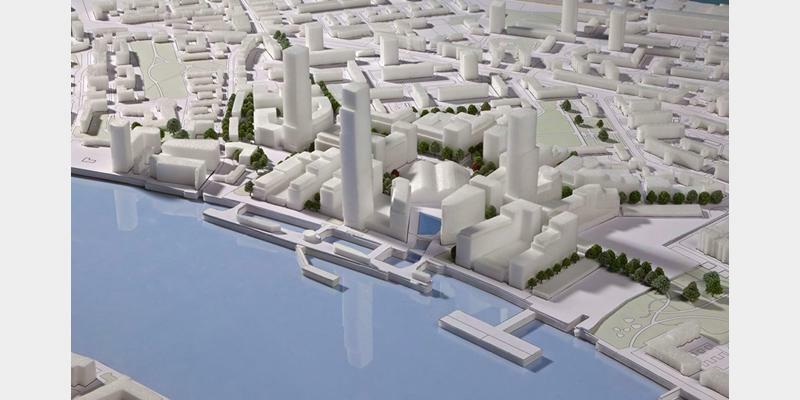 There’s no sign of any such depth in the latest tweaks to the masterplan for Convoys Wharf. 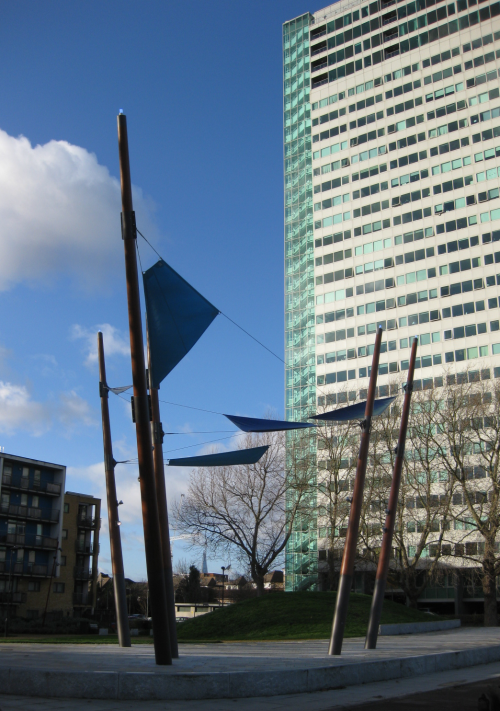 I listened with dismay to the smooth talk on their website about a “contemporary interpretation” of Sayes Court garden, which seems to translate as – wait for it – a couple of lines of trees leading out of the present park, and a few lines in the pavement. All this so-called “consultation,” but no-one among the developers actually listens. So I’ll spell it out in simple terms. 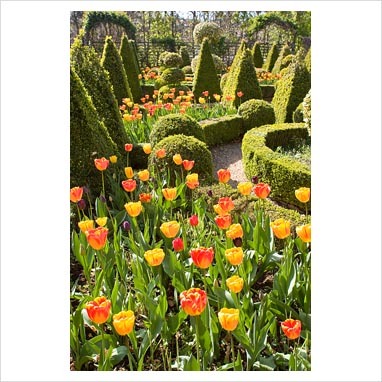 We want an authentic SEVENTEENTH CENTURY RESTORATION of Sayes Court Garden, not a minimalist 21st century “interpretation” for goodness’ sake – there are plenty of those around already! Here, in the order Evelyn wrote them, are some of the rest of the garden mottoes, with their references as I’ve managed to trace them, translations, and a few comments of my own in square brackets. [Now, this is more the sort of message one would expect to read! And lo! the limber vine plaits leafy bowers. Since “dial” could mean a sundial, my bet is that this motto was on or near a sundial in the garden. We know there was one at the centre of the parterre. 4. Inter gestantium complexus, inter adorantium oscula, inter plausus admirantium: hic [?] vis quidem, at [?] gloriosa vita! – Nosegay. “Nosegay”, written right after the motto, probably means that this motto was in his private garden, part of whose function was to provide flowers for making nosegays or posies. If I read this right, it offers us an interesting insight into how he saw his own and his garden’s celebrity. More garden mottoes next time. Many thanks to Frances Harris for kindly sending me photocopies of Evelyn’s motto lists. 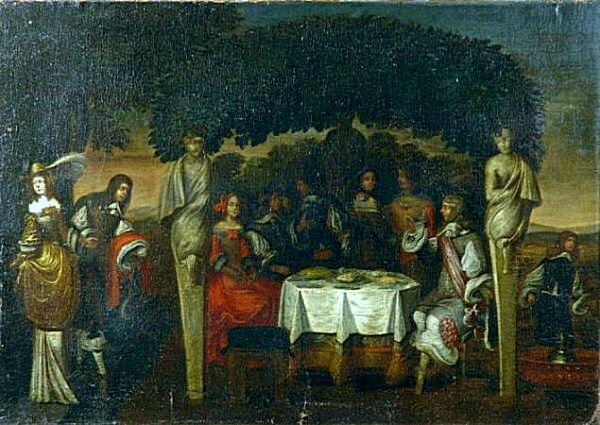 Anyone who knows any more about 17th c. house and garden mottoes, or knows of any surviving examples or images of them, I’d love to hear from you. Also from those whose Latin is less rusty than mine.